Kambree is using Smore newsletters to spread the word online. 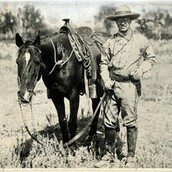 President Roosevelt, A Tree Hugger? The Man Who Loves to Hunt, but Also a Conservationist? Theodore Roosevelt first became aware of the decreased population of bison while he was on his own hunting journey. He discovered that many animal populations were becoming much smaller as people were moving more west. After beginning his presidency, Roosevelt made wildlife conservation one of his most important issues for the nation. Throughout his years, he created numerous national parks and animal reservations. According to the National Parks Service website, Roosevelt saved approximately 230,000,000 acres of land. T.R. is known all over the world for his conservation acts. He created many National Parks including one very close to our home. On May 22nd of 1902, President Roosevelt named Crater Lake a National Forest and park. He also went on the make more parks across the country. In June of 1906 T.R. established the Antiquities act which allowed him to mark anywhere on US soil a historic or prehistoric landmark. As he states his reason for conserving the wildlife in his quote on the National Parks Service website, "I recognize the right and duty of this generation to develop and use the nature resources of our land; but I do not recognize the right to waste them, or to rob, by wasteful use, the generations that come after us." (Theodore Roosevelt, Osawatomie, Kansas, August 31, 1910). 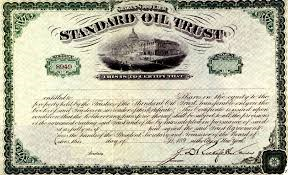 Monopolies and Trusts, Stealing from Americans? During the time of industrialization, there was a small group of people who were responsible for some of the biggest companies in the nation. These men were all very wealthy and owned many businesses throughout the country. The thing that they all had in common was that they all had monopolies. A monopoly is when a supplier and seller of an item are all owned by the same person. When people began to see that monopolies were not good for the nation, the government made it illegal in the US to have a monopoly. There were ways that the rich businessmen could get around the law. They used something called a trust. A trust is where many businesses came together and were put into the hands of one trustee, who would make all the decisions. 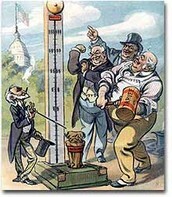 The people were also against this form of business so in 1890 the Sherman Anti- Trust act was passed. This act prohibited trusts and monopolies of any kind in the US. The Anti-trust act was made before T.R. was president. Although he thought that trusts were good for the country, he had to make sure that they were not acting as a monopoly. President Roosevelt became known as a Trust-buster. He would get rid of the trusts that weren't working for the public's benefit. Roosevelt knew what to do and how to keep the nation prosperous. When it came to his trust busting he was very responsible. "Putting The Screws On Him"
During the Progressive era, Teddy Roosevelt was widely known for trust busting, which was the act of breaking up huge organizations that ran like monopolies. He took out the ones that he thought did not have a good effect on the public. 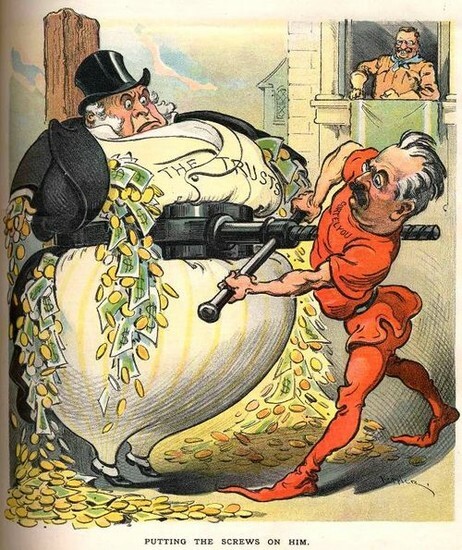 In this cartoon, it shows a rich man (who owns a trust) literally getting money squeezed out of him. The message is saying that these trusts can still exist, but they are controlled and have to have a limit to how much money they can make. The audience is intended towards the public. It is telling them that the government has control over them and wont let them take advantage of the people. Women Taking a Stand in Politics, Ethics, and Even Fashion. Fashion is a never ending art. The way one dresses can explain their personality the way a picture can paint a thousand words. Over the years people around the world have witnessed huge changes in the fashion industry from corsets and bustiers to flapper dresses and feather headbands. During the Progressive era, women had begun to take a stand for their rights. It was time for them to put away their old Victorian apparel and dress for success in the real world. The style had to be more adequate for a work environment so the dresses became less thick and layered, and women accessorized with jewelry and hats. The style represented women as a new force to be reckoned with. They would take the workplace by storm and show all the men what they were made of.